Munggo (mung beans) can be found in any Asian Store. It’s one of the staples in most Asian country. Guisado (sautéed) as what we Filipino are calling mostly of our food because of the way we cook it. In our household, I see to it that I have a variety of Filipino food in our table every week. My desire is to let my children continue to like and love to eat filipino food like we do back home. It is in a way of not to be homesick even with our food. And I’m thankful that they still do! Boil mung beans in water until soft and easily mashed. Set aside. In a pan, heat oil. Cook pork until it turns slightly brown. Add garlic, onions and tomatoes. Sauté for a few seconds until tomatoes wilted. Stir in Chinese sausage (if using) and continue cooking for another 1-2 minutes. Pour in water or broth and add boiled mung beans. Season with patis and salt to taste. Bring to boil and let it simmer until thick. Add ampalaya leaves or substitute. Cover and remove from heat. Serve hot. Soak munggo (mung beans) in water at least 1 to 2 hours before boiling for faster cooking. Have You Tried These Other Cook Filipino Food? 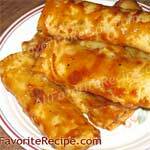 I have tried almost all of the recipes on this site, and all are down to earth soooo goood!!! The only recipe site that is straight forward with all that is posted… This will be my refference site whenever I would want to cook really something good… I went on vacation to Cebu for 3 months and just got back last october… While in Cebu, I used thois site to do some of my cooking ( Chicken Curry, Humba etc ) and not one ever failed me… All came out super good with my guests at my Condo started bugging me with the recipe… I showed them this site…. Thank you so much…. wow! 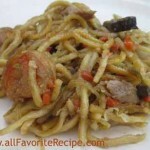 i’m going to try this recipe..i love mongo recipe. 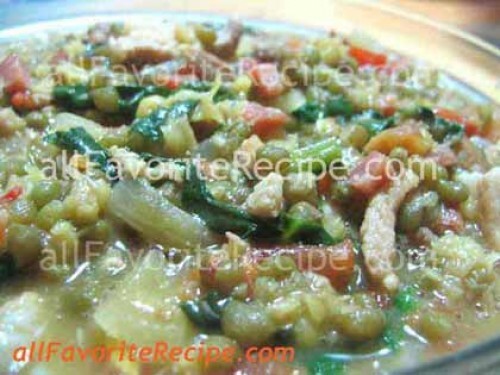 i like mongo becauce it is my favorite ulam. i like this Monggo Recipe..